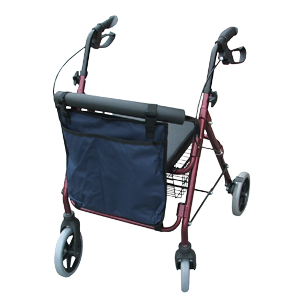 Designed to fit a 4 - wheeled rollator, it is secured with side release buckles to keep it close to the rollator and to ensure that it does not distort stability. Rollator Bag... Designed to fit a 4 - wheeled rollator, it is secured with side release buckles to keep it close to the rollator and to ensure that it does not distort stability. It is available in a choice of Black, Maroon or Navy.